This is A Kiss For The Petals series producer Mi Kara Deta Saba. We’re doing our best to continue bringing you works of yuri, so we appreciate all your continued support. Risa and Miya are unique among the couples in A Kiss For The Petals, in that their relationship was initially largely adversarial, whereas most of the other couples became romantically involved almost immediately following their first encounter. Also, when you spend all these years making 18+ yuri games, you become aware of certain day-to-day particulars as a yuri game producer. I’d like to take this opportunity to discuss some of those, if I may. A Kiss For The Petals: Remembering How We Met Now Available for Pre-order! A Kiss for the Petals: Remembering How We Met is now available for pre-order at 10% off! The game will be available for download and available on Steam on September 25th. Purchases made through MangaGamer.com will come with a complimentary Steam key. Remembering How We Met is the latest chapter in the yuri romance A Kiss for the Petals franchise. 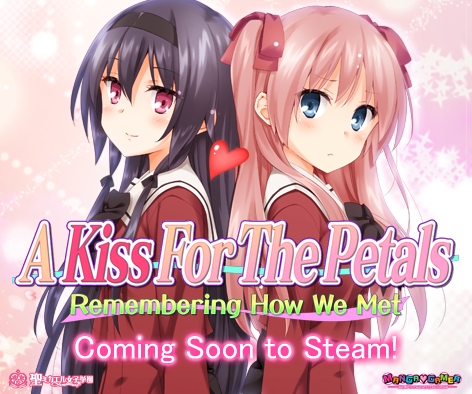 It offers something for both avid fans of the A Kiss for the Petals franchise and new players alike, telling the story of Risa and Meiya’s budding romance at St. Michael’s Girls School. The pair start out as bitter rivals but their relationship eventually softens into something more tender.